HP's latest tablet comes with a top-notch keyboard case, a digital pen and the ability to be repaired in-house. While Microsoft's Surface Pro 4 remains the best-known 2-in-1, the HP Elite x2 offers a good alternative for companies that want to provide their employees with a solid Windows tablet/keyboard combination. One of the latest device types to hit the market is the 2-in-1 -- a tablet that, with the addition of a keyboard, becomes a full-fledged computer. This isn't a new idea -- there have been Bluetooth keyboards available for tablets practically ever since "tablet" became a tech term. And there have been tablets that came with attachable keyboards as well. But now it looks like the category has matured to the point that the 2-in-1 is seen as a possible computer substitute, especially for people who travel and use their systems to make presentations..
HP's recent contribution to this market is its HP Elite x2, which is available from $950 (in reality the price will be near irrelevant as Enterprise buyers will be using these with lease agreements). What sets the Elite x2 aside from some its competitors -- such as Microsoft's Surface Pro, Apple's iPad Pro and Samsung's Galaxy TabPro S -- is that it is aimed squarely at the enterprise user. HP is pushing not only the Elite x2's usability, but also its security and its ability to be repaired by in-house IT departments. Like the Surface Pro 4 and the TabPro S, the 12-in. Elite x2 is a Windows 10 system that includes a detachable keyboard. In fact, the package includes both the keyboard and an HP Active Pen stylus (built with technology from Wacom), which sets it apart from both the Surface Pro (which charges extra for its keyboard) and the TabPro S (which doesn't come with a pen). The tablet is housed in an attractive silver metal casing with a single black stripe along the upper edge. The power and volume buttons are on the left edge (when the tablet is in typing mode), while two Bang & Olufsen speakers are on either end of the top edge. With the keyboard attached, the tablet measures 11.8 x 8.4 x 0.3 in. and weighs 2.65 lb. (1.8 lb. without the keyboard). The 12-in. Full HD display runs a top resolution of 1920 x 1280; it is bright, clean and quite satisfactory, although it doesn't have the intense, rich colors of an AMOLED screen such as the one on the TabPro S. I also found the audio adequate but not impressive. The Elite x2 also sets itself apart in that it offers a number of permutations. The most basic configuration ships with an Intel Core M3 processor with 4GB RAM; 128GB of SSD storage with a micro SD card slot for additional storage; a USB-C port with Thunderbolt for docking and charging; a USB 3.0 port (so that you have somewhere to plug in all your non-USB-C devices); a 2-megapixel front-facing camera and a 5-megapixel rear-facing camera. The Elite x2 offers several other configurations, providing a choice of processor, memory and storage; the highest end is currently a $2,200 model with Windows 10 Pro, a sixth-generation Intel Core M7 processor, 8GB of RAM and a 512GB SSD. The review unit was fitted with a Core M5 processor, 8GB of RAM and 256GB of storage. One thing that HP has definitely got right is the keyboard. I've used the keyboards for the Surface 3 and the Samsung Galaxy TabPro S extensively, and sampled both keyboards for the Surface 4, and this is the most comfortable one I've used on a 2-in-1 yet. The keys are spaced well and have excellent travel; in fact, it would compare favorably with many laptop keyboards. As with the Surface Pro, the Elite x2's keyboard can sit completely flat or use a narrow fold near the top to attach magnetically to the bottom of the tablet's bezel, forming a slight incline that makes it easier to type on. And the keyboard doesn't have to be detached from the tablet when you're finished working; just lift it up against the display to form a cover. The back of the keyboard is covered with a felt-like material, and there is a little ridge that your fingers can fit into, making it easy to carry. The u-shaped stand for the Elite x2 folds out from the back of the tablet. While it doesn't have quite the range of motion that the Surface Pro's stand has, within that range you can adjust it to any position you find comfortable (unlike the TabPro S, which has only two set positions). And it worked quite nicely on my lap. 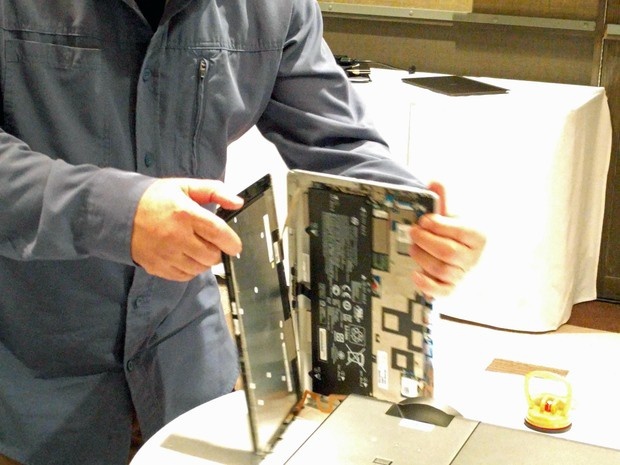 An HP rep demonstrates how the Elite x2 can be opened for in-house repairs. Another thing about the stand is that it is actually user-replaceable in case of damage. In fact -- and this is where HP varies widely from its competition -- the Elite x2 itself can actually be disassembled and repaired (although HP reps cautioned that this was probably something only experienced IT staffers should do). At the recent press demo, a rep demonstrated by unscrewing four tiny screws and then using a suction cup to lift the screen from the unit, revealing the parts within. I had no problem working with the HP Active Pen; although there is no place to store it on the tablet or the keyboard, HP includes two loops that can be attached to the tablet. And the cameras are quite adequate for video conferencing and other business purposes. HP also adds its HP Client Security software, which includes a password manager and a variety of other security features, not to mention the fingerprint reader on the back of the tablet. Battery test results were good, but not overwhelming. On PCMark's battery rundown test -- which puts the system through a steady diet of word processing, data crunching and video -- the Elite x2 came in at 4 hr. 7 min. The TabPro lasted about an hour more, at 5 hr. 12 min. With normal usage, the Elite x2 should last you through a day. 11.8 x 8.4 x 0.3 in. 11.8 x 8.4 x 0.3 in. 11.43 x 7.83 x 0.25 in. 1.8 lb. 1.8 lb. 1.53 lb. n/a 4 hr. 7 min. 5 hr. 12 min. One of the advantages of having several 2-in-1 devices to choose from is that you can start to differentiate by what you want to do with them. The HP Elite x2 is not what I would choose for a consumer item; its display is bright and satisfactory, but doesn't have the deep colors of an AMOLED screen; its audio is adequate but not impressive; and its battery life could be better. On the other hand, its backlit keyboard is the best keyboard/cover I've come across so far, and when you fold it up to use as a cover, it lets you carry the tablet comfortably and securely. In addition, the Elite x2 offers both USB-C port and a more traditional USB 3.0 port, a fingerprint reader, a variety of security software and (not a small thing for an IT shop) the ability to be repaired in-house. In short: While Microsoft's Surface Pro 4 remains the best-known 2-in-1, the HP Elite x2 offers a good alternative for companies that want to provide their employees with a solid Windows tablet/keyboard combination.